Hi there! Today I’m sharing a review for a new contemporary M/M reconnection romance from j leigh bailey. 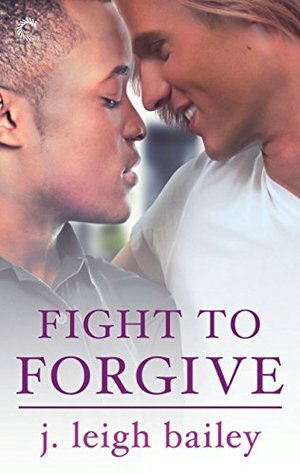 FIGHT TO FORGIVE is a sweet and tender story about childhood besties, and later sweethearts, that got derailed, yet find each other again, at a time when they really need a good friend to lean upon. I really liked NOBODY’S HERO and RECKLESS HOPE, so I was eager to dive into this one! This is the third book in a series that can be enjoyed as a standalone. Aaron and Freddie were childhood besties and high school sweethearts who are now reconnecting after a four-year silence. Aaron’s family is wealthy, and they have a summer home, Elliott House, in Door County, Wisconsin–the place of peace Aaron relished living in, as opposed to the palatial Chicago Gold Coast digs. His late father fostered a deep love of books and literature, a love that Aaron wants to pursue with a Masters degree, but his mother and stepfather have been pressing him to join his stepfather’s marketing firm. Aaron gets physically ill from confrontation–likely due to the tumultuous relationship his mother and father shared. He’s standing up for himself, now, however, when he learns that his father specifically bequeathed him Elliott House and his mother is attempting to sell it without his consent. He vows to go and spend the summer in the house, reconnecting with his memories–of his father, not his love for Freddie. Freddie is a bisexual, biracial Navy boat pilot on medical leave as he recuperates from fallout of a mission gone wrong. He’s unsure if he’ll regain enough use of his arm to return to active duty, and that fear is making him despondent. He’s especially upset when his sister–Nessa–has her plans to purchase Elliott House and make it a B & B derailed by the return of his first–and only–love, Aaron. Freddie’s still frustrated about Aaron’s abrupt departure four summers ago, when he literally ran off the night of his own mother’s second wedding, with a brief note leaving no explanation. I liked how this unfolded. Aaron’s a mouse of a man, and I could accept that given his age and history. I liked how he grew up in this book. His mother’s more than happy to dump all the house business on her book-educated, but reality-slash-adulting-feckless son, hoping that he’ll fail and she’ll get what she actually wants: money. Freddie is constantly around to pick up Aaron’s shattered pieces, because Freddie’s a man of action. He makes a decision and sticks with it–and being Aaron’s protector is a decision he made years prior. But Aaron doesn’t just dump everything on Freddie, he researches and makes choices that benefit others–mostly–but he makes them of his own free will, and takes stands that are important to him. This I liked. It showed maturity that Aaron had lacked. I also liked the interracial issues these boys faced. Having spent some time in rural/leisure area Wisconsin, I could relate to Freddie’s struggle as a (mostly) black kid–and I also got how that was no issue for cosmopolitan Aaron. I say “mostly” because Freddie is mixed-race and this poses unique issues of being neither black nor white “enough” for different factions. It’s a real situation, and Freddie had residual anger from growing up in a locale where he was often considered lesser–for myriad reasons, but often for his skin color. There are secondary players in the book who have vested interests in Aaron keeping or selling the house–and their motives are hard to tease out, at first. Aaron’s inability to decide actually leads to revelations about his family, and That Night, which have Aaron kicking himself. It’s another big reason he grows as a character. There could have been more drama here, but, again, Aaron’s too conflict-averse to hand out the smackdowns that were definitely earned. It made sense, even if it was a little less satisfying. Who doesn’t love when a jerk gets what’s coming, amiright? I think the end was realistic, in that neither man was sacrificing his dreams–instead they recognized the commitments the other had made, and respected that. Their long track record of long-distance friendship and romance gave me the sense that they’d weather the storms of separation well, and come out a strong, united, couple when they completed schooling and enlistment. Interested? You can find FIGHT TO FORGIVE on Goodreads, Carina Press, Amazon and Barnes & Noble. I received a review copy of this book via NetGalley. j. leigh bailey is an office drone by day and the author of New Adult and Young Adult LGBT Romance by night. She can usually be found with her nose in a book or pressed up against her computer monitor. A book-a-day reading habit sometimes gets in the way of… well, everything…but some habits aren’t worth breaking. She’s been reading romance novels since she was ten years old. The last twenty years or so have not changed her voracious appetite for stories of romance, relationships and achieving that vitally important Happy Ever After. She’s a firm believer that everyone, no matter their gender, age, sexual orientation or paranormal affiliation deserves a happy ending. You can find j. leigh online on Facebook, her Facebook Author Page, Twitter, and Goodreads. Thanks for popping, and keep reading my friends!